Hindi kami nakakilos sa aming inuupuan matapos panoorin ang “Sister Stella L”. Para kaming sinampal, tinamaan ng kidlat right between the eyes. Masyado kaming naapektuhan. Gusto naming sumigaw. Talagang gagalitin ka ng pelikula. Kay raming eksena ang talagang titiim ang bagang mo. Manggigigil ka, magngingitngit ka. At pahahangain ka. Gusto mong sigawan ng bravo, yakapin at suubin ng papuri ang mga gumawa nito. Si Mike de Leon na siyang direktor. Si Lily Monteverde na naglakas loob na I-produce ito. Ang scripwriters, ang mga artista, at lahat na ng kaugnay sa pelikula. Alam mong itinataya nila ang kanilang kaligtasan sa paggawa ng ganitong uri ng pelikula. At bilang manunulat, naroon ang hangarin mo upang tulungan ang pelikulang ito na mapanood ng lalong nakararaming mga pilipino. ..nang walang putol! Duda pa rin si Nick sa involvement niya sa welga. Pasulpot-sulpot lang daw siya roon, patulong-tulong. “Kapag nagsawa ka,” anito, “uuwi ka rin sa komportableng kumbento.” Si Stella B. ay kinailangan namang magpunta sa Davao upang tumulong sa isa pa nilang kasamahan doon, lalong nangamba si Stella L. na iiwanan siya nito sa Agoho. “Baka hindi ko kaya,” aniya. Sabi naman ni Stella B. “Puro ka baka, e, kailan mo pa malalaman?” Pinatawag uli si Stella ni Juaning. Sabi nito: “Hindi payag ang kongregasyon sa trabaho mo sa Barrio Agoho.” Sa pagbabalik niya sa Caritas, nagpatiwakal naman si Gigi. Lalong naguluhan si Stella. “Parang bumaliktad ang mundo ko,” aniya. “Marami akong tinatanong. Bakit nga ba ako nag madre?” Sabi naman ni Stella B.: “Madreng lansangan ka pa rin hanggang mamatay ka.” Natuloy ang pag-alis nito, na ang akala’y pinoproblema niya na baka may pagtingin pa rin siya kay Nick. Bilin pa nito: “Kung mahal mo siya, sundin mong feeling mo. Marami namang paraan ngpaglilingkod sa Diyos.” Si Nick ay nagkaroon din ng problema sa trabaho niya. Isang artikulo niya tungkol sa karanasan ni Stella B. sa Isabela na pinamagatan niyang “A Nun’s Story: Military Atrocities” ang hindi pinalathala ng kanilang publisher. “I-rewrite mo,” sabi ng editor niya. “Bawasan mo’ng tapang.” “Ano?” balik niya. “Gawin kong love story?” “Sabi ko, i-rewrite mo, hindi babuyin,” anang editor. Pero sa bandang huli ay nag-give up na rin ito. Tanggapin na raw lamang ang kanilang mga limitasyon. “Hindi lahat ng legal ay makatarungan.” Nagbitiw si Nick sa trabaho niya sa Tribune at lumipat ng pagsusulat sa Malaya. More than anything else, ipinakita ni Mike de Leon bilang isang socially committed at responsible na director ang iba pang posibilidad ng pelikula bilang art at bilang medium of communication. ‘Yung mga laging pumipintas sa pelikulang lokal at nagsasabing walang kuwenta’t saysay ang mga ito, panoorin ninyo and “Sister Stella L” for it is Filipino moviemaking at its best: aware, concerned, and with a universally relevant message. It also shows that an artistic film can be entertaining and as a matter of fact, is necessarily intellectually entertaining (but an entertaining film is not necessarily an artistic one). The movie succeeds in delivering its message because all the elements that went into its completion are excellently executed. It is that rare kind of movie which has no false moves. The screenplay is brilliantly developed and constructed by Pete Lacaba, Jose Almojuela (who is also the assistant director), and Mike de Leon himself. The cinematography of Rody Lacap deserves nothing but superlatives and the musical score by Ding Achacoso is served in a silver platter (napakagaganda ng mga awiting “Sangandaan” at “Aling Pag-ibig Pa” na nilikha niya para sa pelikula). The editing by Jess Navarro and the production design by Cesar Hernando also deserve the highest commendation. We cannot help but gush dahil lahat ng aspeto ng produksiyong ito ay maganda. To make a film like this comes under the heading “they said it couldn’t be done.” Mike de Leon does it, splendidly. In these days when local film faces such problems as exorbitant production cost, commercialism, lack of an intelligent and responsive audience, and censorship, it is heartening to note that movies like this are still being made. Matthew Arnold said that art and society shape each other so artists should deal with serious subjects of moral and social value. This is exactly what Stella L. accomplished, for it allows the viewer to meditate on life and help him gain some insights. Surely no film is an island entire of itself because each movie is made by several men, but the distinguishable personality of an exceptional director is almost always imprinted on his film. We have never really liked the works of Mike de Leon that much and his movies (like “Itim”, “Kung Mangarap Ka’t Magising”, and “Kisapmata”) seemed nothing more to us as exercises in self-indulgence. Starting with “Kakaba-kaba Ka Ba?” though, he demonstrated a newfound cause in making movies, which is further reinforced by “Batch ‘81”. Now, Stella L., offers the pleasure of watching a director as he is hitting full stride, his craft and competence marching in step with history. His deft hand is quickly evident in the cinematography. There is no imposed prettiness in the photography, no straining for arty effects, but the texture is rich and palpable to validate reality, with the effective use of color-acting on the viewer to reinforce the temper and tenor of the story. De Leon handles his intimate and delicate material powerfully, persuasively and penetratingly. He not only executes the technical aspects marvelously but also knows how to work with his actors, both individually and in the here all-important ensembles. The crowd scenes are a delight, with some sequences presented with the veristic quality of a documentary, and each scene is played for maximum impact, immaculately crafted and made with care and conscience, with dedication and devotion. If we now sound so much like an avid de Leon fan, it is because Stella L. is the kind of work that makes a reviewer long for new adjectives of praise. One knows very well that de Leon works for reasons other than money. This makes the strength, sensitivity and symetry of his direction deserve the highest praise and the sweet of music of thunderous applause for it is just better than perfect. Local cinema gives us very few occasions to rejoice and this is one of them. In the large and uniformly excellent supporting cast, Laurice Guillen stands out as Sister Stella B. She is one film director and actress who is really ablaze with talent. As the instrument to Stella L.’s involvement in a much more worthy cause, she imbuesher role with just the right mixture of intensity and charm. Equally memorable are Tony Santos as the beleaguered labor leader, Anita Linda as his courageous wife, and Liza Lorena as the sympathetic magazine editor who is willing to compromise. Gina Alajar is very effective in a very short role as the unwed mother. In the male lead role, Jay Ilagan proves once more that he is indeed one of our most competent young actors available. Must the ability to entertain the audience be the constant guiding criteria in the film and in the performing arts? While certainly, one does not minimize the importance of the entertainment function of the arts, the film Sister Stella L shows that it is not much the ability to entertain that is crucial as the ability to stir and maintain interest. For, as in this film, one cannot really say that the audience is entertained, regaled with spectacular sights, provided a pleasant diversion or titillated by teasing or amusing scenes, but the audience is invited, through the skills of the performers and director, to engage in immediate issues which concern us today. This film thus poses a challenge to our usual notions and expectations of Philippine cinema, as it is not a romantic or domestic drama, a comedy or an action film. The fact that such a film as this appears at this point implies a belief in the development and maturity of the local audience who can, at least from the responses of previewers so far, be receptive to harder stuff. Sister Stella L deals with the contemporary social issues through the experience of various characters, among them Sister Stella L (Vilma Santos) and Nick, her former boyfriend now a journalist (Jay Ilagan), Sister Stella B (Laurice Guillen), the union leader Ka Dencio (Tony Santos) and his wife (Anita Linda). Again, the film differs from most productions nowadays in its immersion in contemporary social reality. The characters, too, possess a strong active aspect of people engaged in a meaningful cause, the people’s struggle for social justice. The nun that Sister Stella B portrays typifies in her strength and honesty the person who has gone beyond purely personal and selfish concerns to embrace the larger role of service to the people. No doubt, it is a refreshing and exhilarating experience to see characters who realize themselves fully as human beings by transcending petty selfish interest and giving of themselves to people in need of support and protection. Because of this, the spirit of the film is highly optimistic and reassuring because it makes us strongly aware of the forces in our midst working for change and of the fact that history is moving forward with these forces assuming the active role. The central issue of the film has to do with the involvement of religious like Sister Stella L and her senior, Sister Stella B, in socio-political affairs. We know, for instance, that one point of view will have priests and religious secluded behind convent walls where their activity is restricted to praying. They are to have nothing to do with life around them as social and political concerns are thought to corrupt their purity and bring in wordly moral dangers and temptations. Or that priests and religious should remain apolitical, not taking sides in socio-political issues, but as men of God, considering all men as brothers who will, in the end, become docile and receptive to preachings of love and unity. The other point of view believes that it is not as simplistic as all that. In fact, it believes that the adoption of a neutral attitude can only serve to dull one’s moral sensibilities and because one shirks from making moral choices, one also renouces one’s responsibility as a human being. In truth, it is of utmost importance, perhaps particularly so for religious, to have a fine and acute sense of moral discernment as applied to social relations, in which the idea of truth and justice operate. The religious who makes grand sermons on love and unity may not himself understand the meaning of truth and justice, because love and unity do not exist in the abstract but are social ideals possible of attainment – only and only when exploitative relationships are destroyed. Otherwise, one contents oneself with hypocrisies. What for instance, would be the love of the rich factory owner intent on profits for the worker, and vise versa. Workers’ wages are only to keep workers alive and in a measure of health for him to have enough strength to operate the machines of work in the fields. Is it enough for factory owner and worker to meet in church and perhaps occupy the same pew – or will religious feel sufficiently edified at the sight? But priests and nuns are citizens of this country as much as any of us and are thus part of the body politic in which they have the right to take active part. Likewise, they are as human as anyone else, and as human beings, they have the drive toward concreteness and totality realized only in social interaction. The Church, too, cannot afford to take a position of alienation and withdrawal, because by doing so it will only continually lose its influence in a time of urgent and pressing realities; otherwise, it will only end up as an outmoded medieval institution. The Church is continually called upon to make moral decisions, and it is through these that the people will know whether it truly supports their cause or whether it only acts as a liaison for exploitative interests. In the film, for instance, there is a conflict between Sister Stella L and her superior who wants her to stay in the convent to act as guidance counsellor and not to engage in labor activities in Barrio Agoho where a strike in an oil factory is taking place. For a while, she obeys her superior to be spiritual adviser to an unwed mother, portrayed by Gina Alajar, who, however, throws her back the question of what does she know at all, as a nun, of human suffering. The task of counselling this individual soul lost in her private hell is fruitless and Gina eventually commits suicide, which serves to show the nun the narrow limitation of such a task. Sister Stella L henceforth knows that she must make the choice of the larger and more challenging field of the workers in struggle. It is also important to note that Sister Stella B tells her fellow nun that although her immediate superior may not approve of her social participation, it is possible that higher superiors will – thus showing that such is still possible within the fold of the congregation. Also, at one time, there arises the question of whether Sister Stella L will stick it out as a religious or continue her activities outside the convent. Upon consultation with her friend, Sister Stella B, she decides to carry on the struggle as a nun, and by so doing, show the importance of such a function for her fellow religious, as well as its validity as a position within the religious orders. The central event in the film is the strike of workers in an oil factory in Barrio Agoho where nuns show their support for the workers by participating in the picket, thereby lending valuable protection. The factory owner (Ruben Rustia) sends goons to harass the picket line, and makes use of the military, which readily lends itself to protect the minority interests of wealthy property owners against the majority interests of the workers. When the strike continues despite inclement weather and hunger, the factory owner resorts to kidnapping the union leader, Sister Stella L, and her journalist friend. All are maltreated and tortured, but the old union leader is finally “salvaged” and thrown into a dump. In the confrontation between the factory owner and Sister Stella L, the former shows himself to be hostile to the workers and to the participation of the nuns: “Kung pati ang mga madre ay nagpapagamit sa mga Komunista, mabuti pang magbago na lang ako ng relihiyon.” To which the nun answers: “Mabuti na ngang magbago kayo ng relihiyon upang hindi parehong Diyos ang sambahin natin.” The murder of the union leader, Ka Dencio, only lends more fuel to the workers’ resolve to continue the strike, which is now led by his wife, with the militant participation of Sister Stella L. The latter’s exhortation to the workers – and by extension to the audience – to engage in the struggle ends the film. A secondary theme is the issue of press freedom, which is explored, in the first-hand experience of Nick, the young journalist. He writes a series on the politicization of the religious and their active participation in mass actions. In the beginning, his motivations are somewhat confused – and this his editor points out clearly to him – because he may be using this as an excuse to follow and communicate with Sister Stella L, who used to be his girlfriend. The journalist, however, understands the futility of the religious confining themselves within convent walls and poses the challenge for involvement. Sister Stella L takes up the challenge – in fact, the journalist’s articles contribute to her politicization. When she gets more and more involved, he becomes protective and anxious for her safety. His articles on the subject barely squeeze through censorship and he experiences increasing difficulty in getting published. Sister Stella L and he are kidnapped by goons and they are physically assaulted even as they witness the torture of the union leader. Instead of intimidating them, the experience completes their politicization and in the end Sister Stella, militant and committed, finds her true social role. Because this movie deals with issues, it has more than the usual amount of dialogue compared with other films. This, however, does not work against it. Since what is talked about is drawn from the very stuff of social reality and thus concerns a large number, it is able to sustain interest. Too much dialogue would be a defect if it dwelt on banalities or inanities or if it narrated incidents rather than portrayed them. In this case, dialogue is necessary for the exploration of issues, as well as for the portrayal of how the characters reckon with ideas and develop in their social consciousness. The audience is not bored provided the things talked about in the film have a bearing on their lives. Filipinos, after all, are a talky lot (think of the large amounts of time spent in coffee shops over coffee or beer). Moreover, these are talky times, because the larger public is rapidly developing critical awareness, and there is now a greater need for interaction and exchange in the interest of survival. There are references in the film which may, at first, seem extraneous, such as Sister Stella B’s mission to Davao where she joins a fact-finding group. However, such references serve to extend the “area of responsibility,” if we may borrow the expression, from Manila to the far-flung provinces. Thus, the unity of the film is not only in the events that engage the characters in Manila but also in a larger over-all spirit of solidarity in which vibrations of sympathy throughout the islands give strength and comfort to those of a common cause. 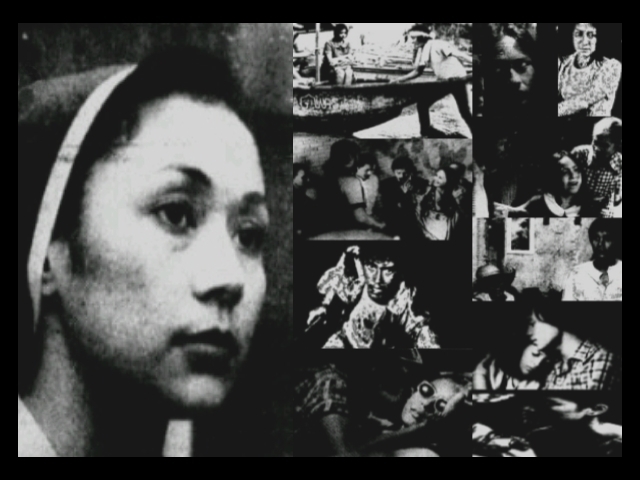 The Continuing Struggle of Sister Stella L.
This entry was posted in Filmography and tagged Anita Linda, Eddie Infante, Filmography: Sister Stella L (1984), FILMS, Gina Alajar, Jay Ilagan, Jose Almojuela, Jose F. Lacaba, Laurice Guillen, Liza Lorena, Mike de Leon, Ruben Rustia, Sister Stella L (1984), Tony Santos Sr.. Bookmark the permalink.